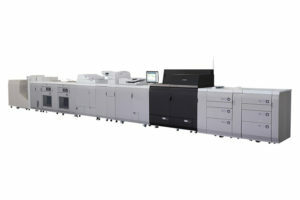 Digital Printing vs Offset Printing? These printers resemble the workings of your desktop laser printer, but on an extremely large scale and with color monitoring. They have the capabilities of producing hundreds of printouts in a matter of minutes. Digital Printing is perfect for shorter runs of a few sheets to 1000 sheets. It provides you with prints that are always the same because you have no balance of ink and water during this process. This can be toner based or liquid ink based. It can be black and white or color. The price for short runs will usually be less using digital compared to offset printing. Very short runs can be much more cost effective using digital equipment. The reason is there is very little or no setup or consumables. Digital Printing makes sense when you need less than 500 pieces printed, have a limited budget, are creating something with a short shelf life and when you need a quick turnaround time. The downside to Digital Printing is a limited paper choice. When it comes to your business and standing out amongst the competition, paper choice means everything. There are 1000 of paper choices but running on a digital printer, your choices drop down significantly because of size, texture, and weight. Lower print quality is another downside to printing Digital. Your colors will not be exact which is especially important to know when you have brand colors. Digital Printing makes sense when you need less than 500 pieces printed, have a limited budget, are creating something with a short shelf life, lower image quality and when you need a quick turnaround time. This method is used when using a plate to transfer from a rubber cylinder onto paper. It’s a huge process and most of your cost comes up front through set-up and producing plates. Offset Printing offers high image quality and it allows you to work on a wide range of printing substrates. It also offers the best quality and lowest costs as print runs grow larger in quantity or size. Offset Printing superior image quality, that is sharp and clean, the ability to print on virtually almost any paper surface and the exact color match using the Pantone system qualities you can’t get with Digital Printing. The Downside to Offset Printing you will pay more upfront when choosing this method of printing, so when you decide to go for the best quality of printing, make sure you choose a large quantity to get the most out of your money. Offset Printing takes more time, Printers need to review files, set up the press, make plates make sure proofs are approved before they can even get started printing your job. Offset Printing makes sense when you know you need specific colors (ie…Logo’s, branding colors, etc…), when you are printing items with longevity, and when you want to make a bold statement with different paper stocks and superior image quality. It really depends on the kind of printing job as to which technology is best suited not only from a cost standpoint but also from a quality standpoint. Both digital printing and offset printing have their advantages and disadvantages.